Dr. Mohammed completed his MBBS from UBG, Khartoum-Sudan followed by his Master’s Degree in Cardiology from Cairo University, Egypt. He also obtained the Fellowship of Egyptian Board of Cardiology from the Ministry of Health & Population, Egypt. He is fully trained in non-invasive cardiology and did his cardiology fellowship training at the National Heart Institute (NHI) in Cairo – Egypt which is one of the busiest cardiac centers in Egypt and the middle east. Dr. Mohammed’s areas of interest lie in Preventive cardiology, Lipidology, Hypertension, cardiovascular disease risk control, assessment and stratification, ECG and Holter analysis, Ambulatory BP monitoring interpretation; stress tests and Cardiovascular disease in women. He underwent training in cardiac and coronary CT angiography (level A & B). 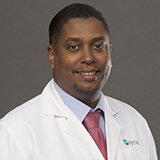 He is also certified in Trans-thoracic echocardiography, basic and advanced life support..
Dr. Mohammed has taken part in various national and international medical conferences and congresses; he has also participated in cardiology fellows training courses in the Sudan as a speaker. He is a member of the Egyptian Society of Cardiology, European Society of Cardiology, American College of Cardiology, American Heart Association and American Society of Preventive Cardiology. He speaks fluent English and Arabic.